Generally speaking most software or configuration issues with your computer can be solved in a relatively short period of time. While computer repair depots are a fantastic service, the time involved in dropping your computer off, waiting for repair and retrieval and re-set up of your computer can be both time consuming and costly. The alternative method of on-site computer repair is very costly and averages around $75-$150 per hour with a 2 hour minimum charge. Some even charge for the travel time. Remote support allows us to provide that needed support to fix your issues at your home, from our office, and often with much less cost. We charge a $55 per instance fee for remote desktop support. This includes up to 30 minutes of connected support. The charge is $60 per hour thereafter with a minimum of 1 hour charge past the initial 30 minutes. Prior arrangements must be made to obtain this support which can be obtained by calling by creating a support instance ticket in the Tech Support section of this website. 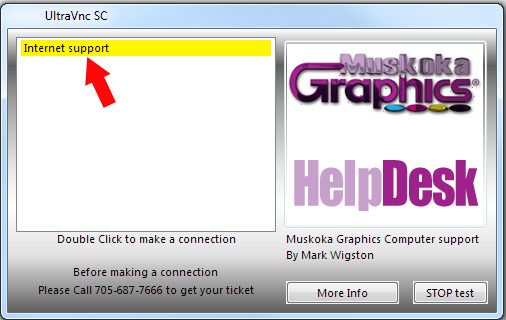 Payment for the initial 30 minute support must be made in advance via paypal before the support help session unless you are a regular customer of Muskoka Graphics. A support ticket can also be opened by contacting support in the Contact Us section of this site. You should double click on the “Internet Support” text shown with a red arrow above. This will allow us to SHARE your screen. 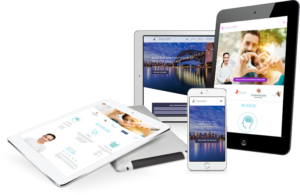 You will be able to see everything that is being done to solve your issue. There is a chat feature should we have questions for you during the process and telephone support is not on the line to talk with you during this. Once the support session has ended you may close the support screen. This program is not installed on your computer and provides no further connection to our service and the procedure must be repeated should you need support in the future. If you have already been instructed to download the live support module, you may download it from here. This does NOT install on your computer and disappears once support is finished.